It’s funny how shadows can be good and bad. A person standing in the right spot to shield the sun from our eyes, is a good shadow. Yet the clouds maneuvering themselves in front of the sun on a bitter winters day, creates cold and dark shadows. As a leader I know I cast good and bad shadows. As a leader, I have made some dreadful decisions that have caused the company and people significant hardship. In these times the shadow I cast has been lousy. As a leader, there are even times I manage to cast a good, positive, warm shadow. By learning to care more. Or execute better. Or empower my team. When I do this I see the culture ripple down throughout the organisation in a beautiful way. 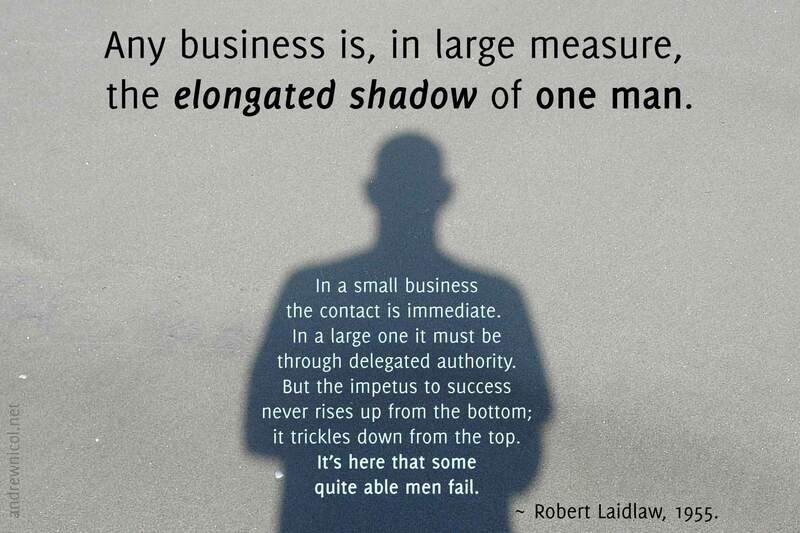 I think Robert’s phrase says it all and I’m reminded again this week about the shadow I cast. Still a long elongated way to go … but a work in progress. As a leader what shadow are you casting? Reblogged this on People Matter ∴ Do Good.